On Saturday, March 30th, at 10am, you have the chance to compete for a guaranteed seat at the 2019 Catan Canada Nationals Tournament at EGLX Toronto in October. The Champion will also join the other Qualifier Champions and Catan Studio for a celebratory dinner on Saturday night of the National Championship. The Catan Canada National Champion will move on to the 2020 Catan World Championship, location and dates to be announced at a later date. Competitors must be a Canadian Citizen that is 18 years of age. You must preregister, below, or in store. 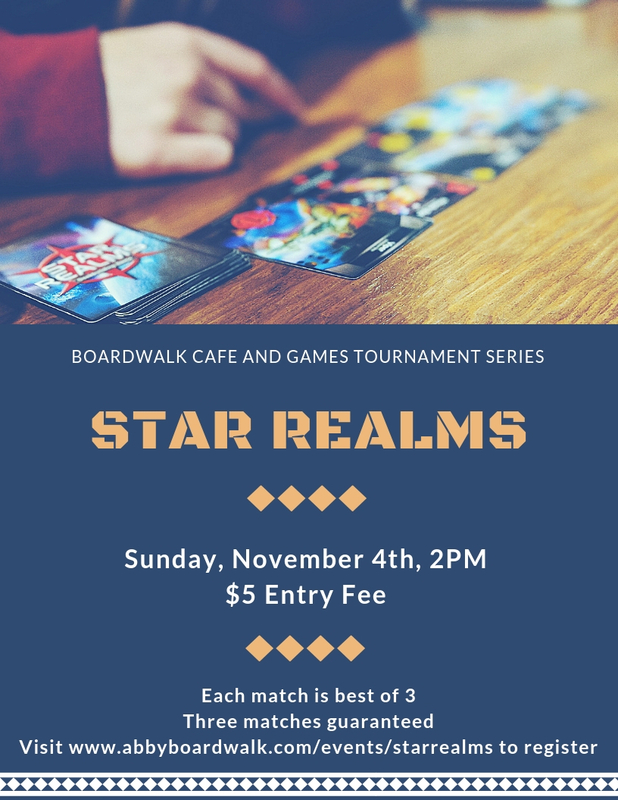 On Sunday, November 4th, at 2PM, take to the stars in our Star Realms tournament! Compete for prizes and complete supremacy of the universe through a series of best-of-three matches in two phases; a Swiss-style tournament group stage before a single elimination bracket. Limited spots available — register below to secure your spot! Punch your ticket to victory! Boardwalk Cafe and Games presents a one-night Ticket To Ride Tournament! Thursday, July 19 at 6pm, face off against the toughest of competition to determine who is the trainiest of them all! Original Ticket To Ride base game only. 6pm Start time, 3 games guaranteed, lots of prizes! 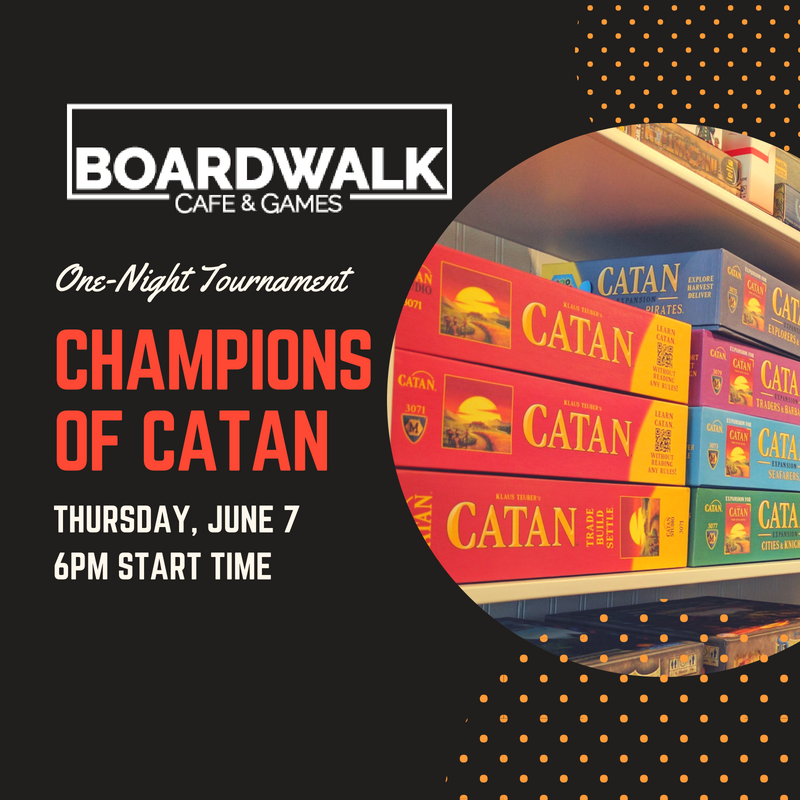 Thursday, June 7th at Boardwalk Cafe and Games, the ultimate showdown of Catan prowess. Can you settle the land the best and prove that you are the greatest settler of Catan? Can you collect the most sheep and trade them for the most wheat? Can you buy the most Development Cards and bluff your opponents into thinking they just might not be Soldiers? Can you tell that we're running out of ways to make this tournament sound epic and intense? Player registration at 6PM, first game starts at 6:30PM. Each game has a maximum of 4-players. No expansions, base game only. Prizes for the four finalists, grand prize for the champion. Prizes valued at over $250! Guaranteed two games. Top four players move on to a final game. Top players are determined, first, by number of wins. If a tie exists, the winner will be determined by the total cumulative points from both preliminary games. If a tie still exists, the winner will be determined by the sum of the percentages of total points won over the two games. This tournament is open to all skill levels though a basic understanding of Catan is encouraged as there are strict time limits for each game. There is no age limit for this tournament but all competitors are expected to be able to play on their own with no guidance or assistance (no team play) and have a basic understanding of the rules of Catan. Come ring in the new year with us! We'll be open from 2pm until 1am on December 31st with food and drink specials running all evening. Grab some friends and reserve your seats by phone, email, or direct message on Facebook or Instagram. Seating will be given out on a first come, first serve basis. See you there! Back by popular demand and, once again, partnering with our neighbours from just down the street, 2 covers, 2 drinks, and 2 custom made doughnuts for $22! Reserve your spot today as quantities are limited. Camp Boardwalk is a half-day camp for kids aged 8-12. Campers will learn new games, make new friends, eat snacks, and get to take home a game and some free passes for their parents, friends, or siblings! 9am til noon, Monday, July 17 to Friday, July 21, 2017. $60 for every sibling after. Don't have a regular group of friends to play games with? Want to meet new people and learn new games? Only have one friend but want to play a 4 player game? Come to the Midweek Meetup to mix and mingle with gamers who want to meet new people while playing some great games! Come as you are, on your own or with a friend, and try something new! No RSVP required, just show up between 6-10pm and check in with the front counter! Parents, bring in the kids and play some games! Families get 25% off their total cover charge! 2 covers, 2 drinks, 2 treats for $22! What better way to show someone you care than by absolutely destroying them at your favourite game? Come down on Thursday, June 15th for a date at Boardwalk Cafe and Games and get 2 Covers, 2 Drinks, and 2 Treats for just $22!